As the ozone rating in San Antonio continues its slow upward march, area officials are beginning to investigate whether oil and gas drilling in the Eagle Ford Shale has anything to do with it. But their efforts are fraught with complications. As the ozone rating in San Antonio continues its slow upward march, area officials are beginning to investigate whether oil and gas drilling in the Eagle Ford Shale has anything to do with it. But their efforts are fraught with complications. And they remain far from answers in what is sure to be a high-stakes debate over the environmental impact of one of the country’s newest and fastest-growing oil and gas development regions. That “big stick” is held by the Environmental Protection Agency. For years, San Antonio has touted itself as the largest American city that is in compliance with federal ozone standards, and therefore not subject to extra regulation and enforcement from the EPA. That will soon change. Today, San Antonio is violating the Clean Air Act based on its ozone scores, the highest of which are far above the maximum acceptable value of 75 parts per billion. 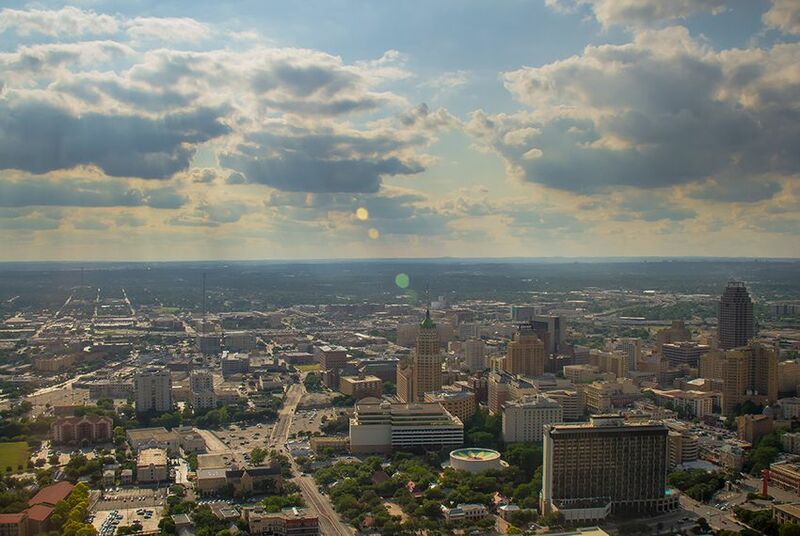 "The San Antonio region has really become much more of an interest for ozone problems than it ever was before,” said Daniel Cohan, an associate professor of environmental engineering at Rice University who studies the formation and control of air pollution. Not only have the region's ozone levels started to increase, but the EPA also lowered its ozone standards from 85 parts per billion to 75 parts per billion in 2008, during the final year of George W. Bush's presidency. San Antonio's ozone uptick is relatively recent. The city’s ozone numbers dropped dramatically in the beginning of the last decade; in 2007, it was under the federal limit even during some of the hottest days of the summer. But soon afterwards, ozone levels began to increase again — just as the first wells were being drilled in the Eagle Ford Shale, now a 400-mile swath of oil and gas production stretching from South Texas’ Mexico border all the way to East Texas, brushing the southern tip of the San Antonio metropolitan area. The fourth-highest ozone level recorded each year from two of San Antonio's air quality monitors, referred to as C58 and C23. The three highest ozone levels are discarded each year for official calculations. That timing has not been lost on anyone. “I think that there can be and there might be impacts” of the oil and gas development, Bella said. This month, AACOG produced its first estimates of the Eagle Ford Shale’s emissions of volatile organic compounds (VOCs) and nitrogen oxides (NOX), air pollutants that are the precursor components of ozone. The numbers are very preliminary and have not been shared publicly. But they suggest that the oil and gas extraction-related activities in the Eagle Ford Shale result in dozens of tons of emissions of VOCs and NOX every day, according to AACOG's estimates. Such emissions would be equivalent to as much as half of what’s emitted daily by the entire San Antonio-New Braunfels metropolitan region each day. During a recent health forum in San Antonio, AACOG officials suggested that Eagle Ford activities could increase the city’s ozone score by several parts per billion within the next decade. Spokesmen for the Texas Oil and Gas Association and the South Texas Energy & Economic Roundtable, which was established by the 11 largest operators in the Eagle Ford Shale, did not respond to requests for comment. But Bella cautioned that it’s still impossible to know whether oil and gas activities are behind San Antonio’s change in air quality. The Eagle Ford Shale stretches across more than 20 counties, he said, so its emissions would be dispersed over a much larger area than just San Antonio. And there are many other reasons that could explain the ozone increase. San Antonio’s population grew by 16 percent between 2000 and 2010, according to the latest census. Everything from more cars to gas stations to a higher demand for power would affect air quality. It’s not easy to identify the source of ozone, either. “We don’t have emissions of ozone,” said Cohan, the air pollution researcher from Rice. “We have emissions of nitrogen oxides and VOCs.” Depending on the conditions of a specific region, VOCs may drive the ozone problem more than NOX, or the other way around. And VOCs could be thousands of different types of hydrocarbon gases, all of which would have different impacts on ozone. Air pollution experts at the Texas Commission on Environmental Quality, which will soon review AACOG’s report and help with revisions, have their own thoughts on the matter. They don’t believe that the Eagle Ford Shale is a major cause of the ozone changes in San Antonio, based on the data they are monitoring. 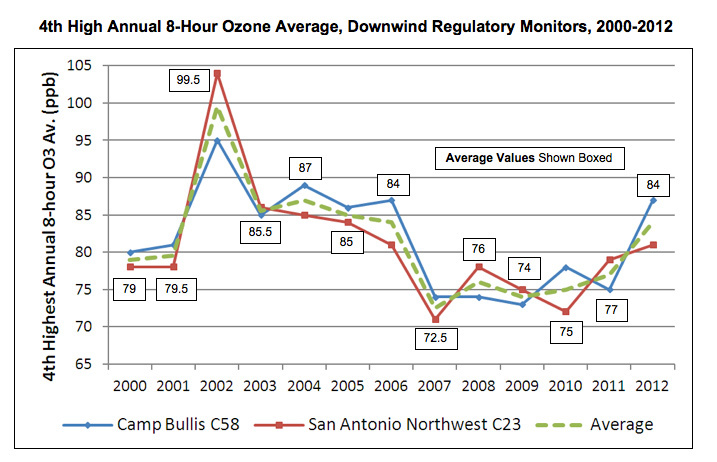 Three air pollution monitors in San Antonio report ozone measurements that are used for official purposes. 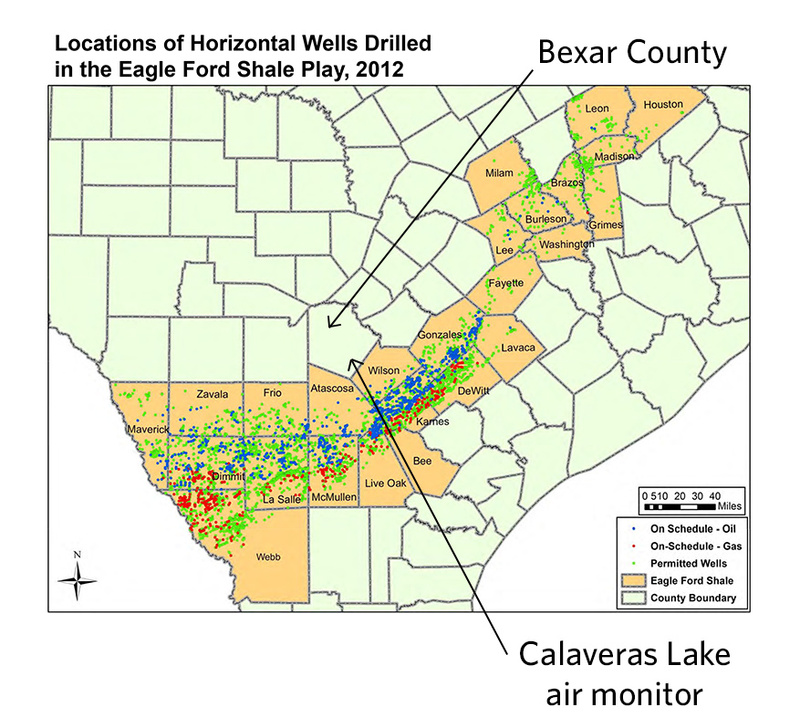 Two are in the northwest part of the city, and one, known as the Calaveras Lake monitor, is on the southeast border of Bexar County, just north of the Eagle Ford Shale. Of the three monitors, the Calaveras Lake one has consistently shown the lowest ozone levels. The two northwest monitors, where the local population is higher, show much higher readings. Sometimes the measurements are highest when the wind comes from the south — which could point to the Eagle Ford Shale wells — but often that is not the case. Craft, of the Environmental Defense Fund, doesn’t buy that explanation. “It takes some time for the ozone to form from the chemical reactions that are happening,” she said. Cohan said TCEQ’s reasoning is plausible, but that NOX emissions can have a significant impact on ozone levels even from far away. Whatever the reason for the ozone level increase, the city is preparing for the EPA to give it “non-attainment” status, and possibly subject it to another level of regulations and enforcement. The only reason the EPA hasn’t done so already is that the process of awarding compliance happens every few years, and the new cycle is currently under way. “It’s kind of inevitable,” said Dr. Thomas Schlenker, director of the San Antonio Metropolitan Health District. His department is proposing a plan to the San Antonio City Council that would allow the department to license some 3,000 businesses, including laundromats and car repair shops, and begin inspecting them to measure and control their emissions. "We believe that if we demonstrate that we are doing everything that is reasonable, that might be to our benefit in terms of enforcement by the EPA,” he said.